I live in a cold climate, where the winter months can be quite long. Because fresh, local, wild food and herbs are not as readily in the winter months, I spend a lot of time during the fall months preparing food and medicine to have on hand for winter. As I harvest and put up winter stores, I ask what might I need for the upcoming months to keep myself, my family and my community healthy. Of course this is a multi-layered question, requiring a range of responses. Preparing requires planning as well as action. In order to prepare I start by brainstorming ways to stay healthy and strong as well as some of the winter ailments and issues that we have dealt with in the past. Below you will find a list of things you will find in our pantry as well as items found in our medicine chest. I hope these inspire you as you fill your pantry and medicine chest with nourishing food and herbal remedies. Here a list of food items I like to have on hand so that we are stay healthy and strong. I am sure this list is not entirely complete, but it is the foundation for my winter food stores. ~Bones, lots of bones. We make bone broth quite often and either drink it or add it to the eternal winter stew pot. We also have venison and rabbit in the freezer, and the salmon our neighbor so generously shares with us, from their fishing trips. ~Green vegetables, I like to freeze vegetables and wild greens so that I can continue to eat local and wild greens throughout the winter. We also water bath can tomato sauce, adding wild greens and mushrooms as well as seaweed and herbal vinegar to increase the nutrient density of the sauce. I also lacto ferment many a vegetable including cabbage, carrots, beets, kalhrabi, green beans, brussel sprouts and many more. Over the years I have fermented almost every vegetable that has crossed my path. ~Root vegetables, I like to store these in cold storage for as long as possible so that they can be eaten fresh. Beets I like to put in a vinegar brine and water bath can so we can eat them throughout the winter. I also lactoferment them. ~Fruit, putting fruit and particularly berries in the freezer as well as canning them whole and in the form of sauces and jams and jellies. We also dry fruit either whole or in the form of fruit leather. Fruit leather is nice added in small pieces to homemade sourdough bread, but also just eating it is satisfying and most of all nourishing. One nice thing about canned fruit, is you can open it, put a tsp of whey in it and/or add a kefir culture, let it sit for a couple of days and you have fermented fruit, which is delicious and nutritious. ~Drying greens and herbs for later use. For making nourishing herbal infusions as well as for adding to the soup pot. We will dry throughout the year the wild salad greens that we do not finish fresh. We dry them on a screen or flat basket and then store them in the pantry. We dry a vast array of greens in the salad, and we dry nettle, oats, rosehips, comfrey, linden and mullein for our daily infusions. ~Drying nuts and storing them for winter is another important staple in our pantry. We dry black walnuts, hazelnuts and hickory nuts. We have a friend who sends us pecans and we enjoy them as well. These are added to many of our meals and I make a snack of soaked and toasted nuts, tossed with seaweed. ~Herbs for topical application. Dry skin, sore muscles as well as strains and sprains are things I like to be prepared for for the winter months. Infused oils are an important component of my medicine chest and I like to have Calendula (Calendula officinalis), Chickweed (Stellaria media), St Johnswort (Hypericum perforatum) , Comfrey (Symphytum officinale), Yarrow (Achillea millefolium), Cottonwood (Poplar sp) and Lavender (Lavendula officinalis) on hand. These herbs will help me in responding to many concerns including dry skin, inflammation, cold sores, sprains and strains and sore muscles (after shoveling snow). ~Herbs for internal applications. The medicine chest contains dry herbs for making infusions, which are in the pantry section, as we drink these daily. It also contains dry herbs that we many only enlist if we have symptoms ie fever, sore throat, cough etc. In addition, to dry herbs we like to have tinctures (alcohol extracts) on hand. 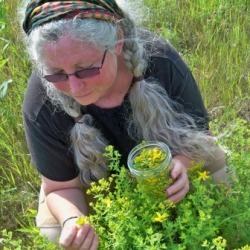 Many of the herbs we put up in oil form, we also store as a tincture ie St Johnswort (Hypericum perforatum) , Yarrow (Achillea millefolium), Calendula (Calendula officinalis), Cottonwood (Poplar sp) and Chickweed (Stellaria media). Tinctures are nice as they can be accessed quickly and applied right away. We also put up in tincture form herbs that have an affinity for the immune system: two of these are Echinacea (Echinacea purpurea) and Bee Propopolis. We make many tinctures for many purposes, but these are staples that we often use during the winter months. We also make cough syrups, the simplest of which are oxymels. ~Locenges or Pastilles. We make these in a very simple form by using powdered herbs and our own honey. Slippery Elm (Ulmus rubra) and/or Marshmallow (Althaea officinalis) Root Works well. Ginger (Zingiber officinale) , Rose Petals (Rose sp) and orange peel (Citrus × sinensis) are wonderful herbs to add as well. ~An oxymel is just a sweet and sour herbal syrup. It contains: vinegar, honey & herbs. They're very beneficial for respiratory conditions, so the herbs contained therein will usually reflect that. ~Fill a jar about half to three-fourths full of herbs. ~Pour the jar 1/3 with honey. Ideally this would be raw local honey. ~Fill the jar 2/3 or the rest of the way with vinegar OR for a sweeter syrup, try 1/2 jar honey and 1/2 jar vinegar. (I am using raw apple cider vinegar). *the amounts that you use can be flexible. Both honey and vinegar act as preservatives, so you're not going to ruin the mixture by altering the ratios. ~Stir it all together; it might not blend well at first, but it will settle and blend over time. Just stir and or shake until it is blended. Then strain the herbs out, bottle it up and store in a cool place or the refrigerator. Take oxymels by the spoonful for sore throats, thick congested coughs or as a general treatment to combat colds and flu. *Horseradish: opens the respiratory system and fights off infection. *Rosemary: Useful for low energy and poor circulation, good for digestion and nerves. *Thyme: for upper respiratory infections, coughs, bronchitis, antiviral and antibacterial.